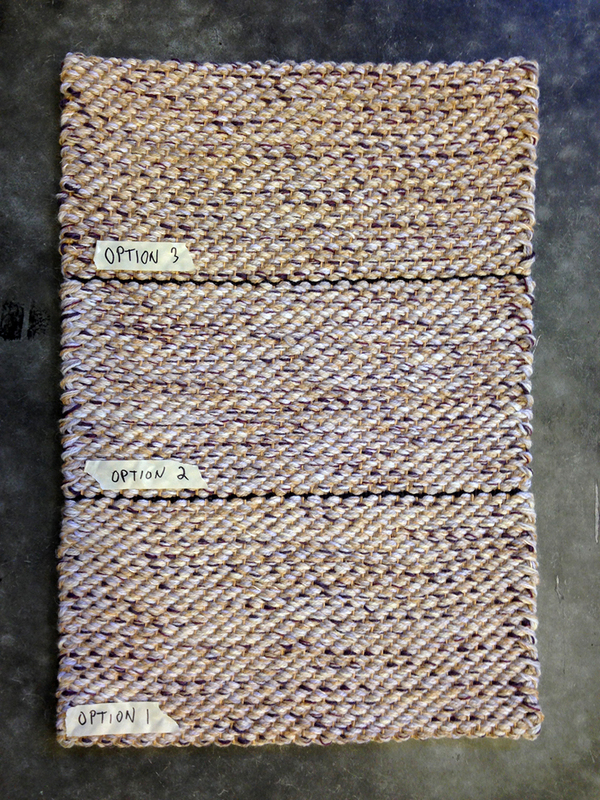 We can do all kinds of custom color but sometimes it helps to start with a favorite sample and make adjustments. This client had a cream and blue sample of ours, FWT-33 Coast (below left). She wanted to replace the blue with purple accents. She gave us paint chips, fabrics and poms so we could not only match the purple she wanted but also the neutral tones in the room. The winner was Option 2 with it's cool tones. Aurora weaving FWT - 33. Twill in custom colors. 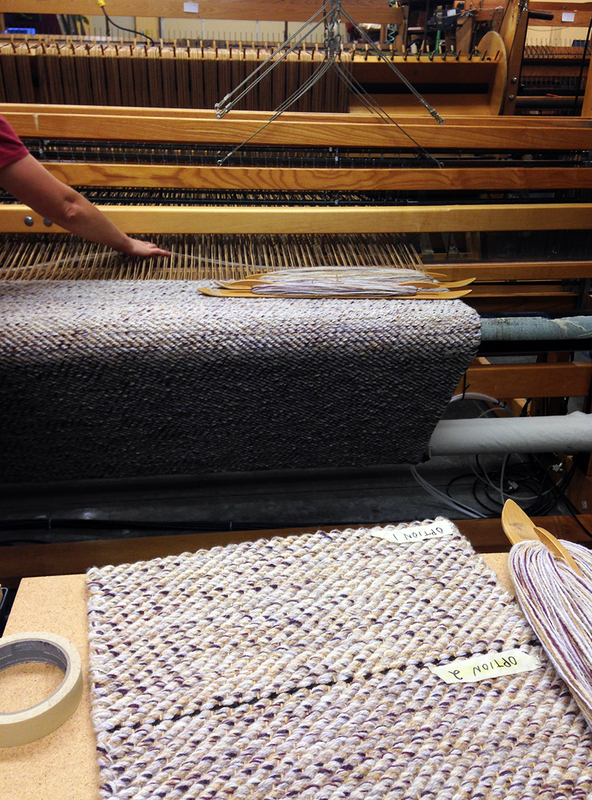 Weaving the Twill. By alternating 3 shuttles of yarn, we can create a little accent of purple. In the photo below, you can see the purple dominant group just above Aurora's shoulder. One shuttle has no purple and the 3rd shuttle( in the foreground) has just one thin purple and the rest are cream and white. FWT - 33. Twill in custom colors. 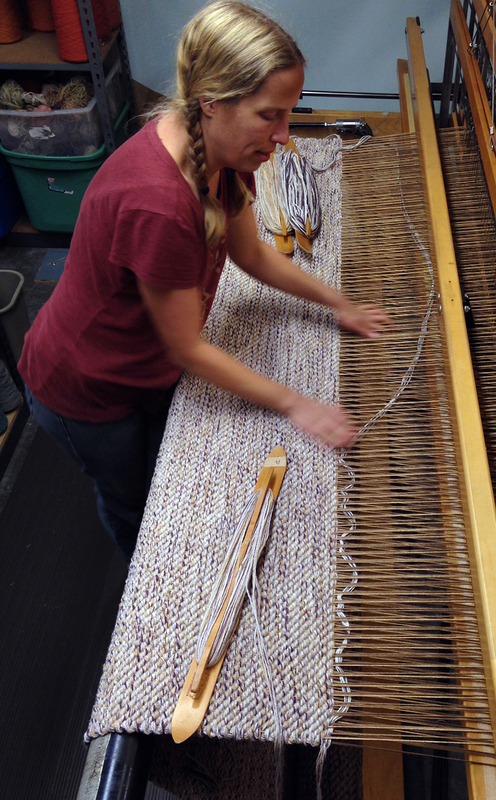 Here's the finished rug that came in at 6'3" x 9'0" on our shop floor. The colors combine to create a nice hazy feeling. Finished 6'3" x 9'0" . FWT - 33. Twill in custom colors.